Anambra is a state in southeastern Nigeria. Its name was inspired by one of its Northern and riverine clans Anam but merged with "branch". The colonialists who travelled from the present day Anambra region to present Northern Nigeria often described where they were coming from as "Anam branch". The term coupled with Omambala, the Igbo name of the Anambra River formed the name Anambra. The capital and seat of government is Awka. Onitsha, a historic port city from pre-colonial times, has developed as by far the largest urban area in the state. The state's theme is "Light of the nation". Boundaries are formed by Delta State to the west, Imo State and Rivers State to the south, Enugu State to the east, and Kogi State to the north. The name was derived from the Anambra River (Omambala)m which flows through the area and is a tributary of the River Niger. The indigenous ethnic groups in Anambra state are the Igbo (98% of population) and a small population of Igala (2% of the population), who live mainly in the north-western part of the state. Anambra is the eighth-most populated state in the Federal Republic of Nigeria and the second-most densely populated state in Nigeria after Lagos State. The stretch of more than 45 km between the towns of Oba and Amorka contains a cluster of numerous thickly populated villages and small towns, giving the area an estimated average density of 1,500–2,000 persons per square kilometre. Anambra is rich in natural gas, crude oil, bauxite, and ceramic. It has an almost 100 percent arable soil. Anambra state has many other resources in terms of agro-based activities such as fisheries and farming, as well as land cultivated for pasturing and animal husbandry. It has the lowest poverty rate in Nigeria. In the year 2006, a foundation-laying ceremony for the first Nigerian private refinery, Orient Petroleum Refinery (OPR), was made at Aguleri area. The Orient Petroleum Resource Ltd, (OPRL) owners of OPR, was licensed in June 2002, by the Federal Government to construct a private refinery with a capacity of 55,000 barrels per day (~7,500 t/d). In 2012, following the efforts of Governor Peter Obi and other stakeholders of Orient Petroleum, Anambra State became an oil-producing state. The indigenous company struck oil in the Anambra River basin. On August 2, 2015, the management of Orient Petroleum Resources Plc said the company planned to increase its crude oil production to 3,000 barrels per day by September 2015, as it stepped up production activities in two new oil wells in its Aguleri oil fields. An indigenous company, Nails and Stanley Ltd, was to establish a gas plant at Umueje in Ayamelum Local Government Area to support economic activities in the oil and gas industry in the state. Since the late 1990s, there has been a migration from rural to urban areas in the state, resulting in Anambra becoming a highly urbanized state: 62% of its population lives in urban areas. In October 2015, the APGA-led state government of Willie Obiano signed a memorandum of understanding with Galway modular housing company, Affordable Building Concepts International, for 10,000 housing units to be built in the state. Given decades of neglect of infrastructure and bad governance, the shift in human migration has posed problems for the state. Infrastructure improvements, both physical and social, have lagged behind the growth in population. There are problems in environmental sanitation, erosion control, and provision of social services. Major cities have become characterized by inadequate and deteriorated road networks and walkways, unregulated building patterns, poor sanitation, uncontrolled street trading, mountains of garbage, and chaotic transport systems, creating congestion, noise pollution, and overcrowding. The government of Peter Obi, with the assistance of the UN-HABITAT, produced 20-year structural plans (2009–2028) for three major cities in the State: Onitsha, Nnewi and Awka Capital Territory, to restore urban planning and guide their growth into the future. The plans contain policies and proposals for land use, city beautification, road infrastructure, industrial development, housing, waste disposal, water supply and health and educational facilities to turn the cities into successful urban areas that can generate employment and wealth, and provide high living standards for their residents. Anambra became the first state in Nigeria to adopt Structural Plans for its cities. With effective implementation, it should systematically grow as a major economic center in Nigeria and West Africa. The process of urbanization is fairly contributed by population growth, immigration, migration, and infrastructure initiatives like good road, water, power, and gardens, resulting in the growth of villages into towns, town into cities and cities into metros. To have ecologically feasible development, planning requires an understanding of the growth dynamics. There is a fear that if too many people leave the villages, only the aged men and women will be left to farm. This pattern has been seen in Amesi, Akpo, and Achina towns in Aguata local government area. They have been important in the production of yam, Cocoyam, and cassava through consistent agriculture, but such activities have suffered due to the out-migration of youth to the urban centres. There has been both food scarcity in the region and over-population in urban areas. To upgrade the State capital and improve traffic, Awka, Governor Willie Obiano signed off on construction of three fly-overs between the Amawbia and Arroma end of the Enugu-Onitsha Expressway, a distance of about three kilometres within the city. Agulu Crocodile Lake is located along Awka road in Agulu, Anaocha Local Government Area of the state. A potential tourist site, it is home to an estimated three hundred crocodiles and water turtles. Fishing is not allowed on the lake. As the crocodiles are considered sacred animals, they cannot be killed. Legend says that these crocodiles were instrumental in delivering the town from enemy soldiers during the Nigerian civil war. It is believed that these sacred crocodiles and turtles transformed themselves into beautiful ladies and lured the soldiers unawares into the lake, where they disappeared without trace. At noon the crocodiles and the turtles appear at the banks of the lake to take in sunlight. Ogbunike Caves, listed by UNESCO as a World Heritage Site, is one of the most visited tourist sites in Anambra State. It is classified as a Sandstone cave (Lateritic sandstones of Campanian-Miocene age). It has very scenic vegetation with an attractive waterfall. It is situated in the Ogba hills Ogbunike, across the Ugwu-Aga Escarpment Umunya by the Enugu/Onitsha Expressway, and lies in the coordinates of N06 11 11 and E06 54 21. Igbo Ukwu Museum: Igbo Ukwu is an ancient town known for its astonishing metalcrafts; it continues to attract tourists to see its bronze artifacts. First noticed in 1938, the bronzes were later excavated by Thurstan Shaw (an English archaeologist). They have been dated to the 9th century, and are of high value and historic relevance. Uzu-Oka: Awka is historically known for the great metal foundry, Uzu Craftmanship. Imo-Awka is an annual festival celebrated by the natives. Imo-Awka Festival of Awka. the biggest tourist show in Anambra; this is held annually starting in June–July. Ijele Masquerade- listed in the UNESCO Archives as an Intangible Cultural element. The Ijele dance festival is home to the 'Olus' of the Omambala area: But actually originated from Umueri, other towns in includes Anaku, Omor, Nsugbe, Aguleri, Umueri, Awkuzu, Nteje, Ogbunike, Nkwelle-Ezunaka, Umunya, etc. But the origin of Ijele can be traced to Umueri community. Many towns celebrate the New Yam Festival, held after yam cultivation each July. Otite, Anam New Yam Festival. Nwafor Festival at Ogidi and Ogbunike. Ajana-Ukwu and Igu aro festivals at Aguleri. Akwuneche enyi masquerade of Omambala area: Anaku, Igbakwu, Aguleri, Umuleri, Awkuzu, Umunya, Owelle- Olumbanasa etc. Izaga masquerade of Omambala area: Anaku, Igbakwu, Aguleri, Umuleri, Awkuzu, Umunya, etc. Abele masquerade of Omambala area: Anaku, Igbakwu, Aguleri, Umueri, Awkuzu, Umunya, etc. Obele Masquerade of Owelle -Olumbanasa. Afia olu Festival in Nnewi. Ofala Eze of Owelle -Olumbanasa. Amanwulu and ozo Festivals at Aguleri, Anaku. Olili Obibia Eri (Eri Festival) in Enugwu Aguleri attracts thousands of visitors home and abroad annually. Uzoiyi Festival Umuoji attracts thousands of visitors annually. Ofala (Ovala) Festival commemorates the Kingship (Eze) and is celebrated by various towns. It was popularised by Onitsha town. Igu-Aro is the major kingship festival among the Umueri, Anaku and Aguleri. Nkpokiti Dance, Umunze is known for fantastic acrobatic performances. Obo Ofor Festival in Uga, Aguata local government area. Nkwor Festival in Uga, Aguata local government area. Uku, an annual masquerade festival in Amanasaa Umuchu, Aguata local government area. The River Niger at Onitsha and Asaba, with the famous Niger bridge, is the eastern gateway linking the South East with the Niger Delta and Western Nigeria. Obu Gad at Enugwu Aguleri. Ini Iguedo (Iguedo Grave) at Nando. Awka, the state capital, is also the center of Nigeria's metalwork and carving industries. Educationally, Anambra is a centre of excellence. There are the Nnamdi Azikiwe University (UNIZIK), Awka, and a federal university with a College of Medicine situated at Nnewi. The UNIZIK Nnewi runs a modern teaching hospital, with facilities also at Umunya and Ukpo. UNIZIK also has faculty of pharmaceutical sciences at Agulu, a School of Preliminary studies at Mbaukwu, and a College of Agriculture. The Anambra State University, formerly known as Anambra State University of Science and Technology (ASUTECH), has two campuses, one in Uli, and another at Igbariam; the Federal Polytechnic, Oko; Nwafor Orizu University of Education (formerly known as the Nwafor Orizu College of Education), Nsugbe. Private universities include The Tansian University, Umunya; Madonna University, Okija; and St Paul's University, Awka. Literacy rate in the state is comparatively high compared to other states. [specify] Primary and secondary school enrollment in the state is one of the highest in the country. Consequently, Anambra state has the highest number of JAMB candidates going after the limited number of spaces in Nigeria's tertiary colleges. Since 2011/2012 till date (2014), its students have had the best results in both WAEC and NECO-conducted senior secondary school examinations. Anambra's political history can be described as varied. Until the early 21st century, it was marked by considerable unrest. Having a long list of "firsts" in Nigerian history, it has been known by the sobriquet as "The Light of The Nation". On May 29, 1999, Chinwoke Mbadinuju was sworn in as civilian governor of Anambra state, after many years of military rule. His administration was marred by deep problems: the most notable was withholding of teachers' salaries in the school. The teachers finally conducted a ten-month strike in all the government secondary schools in the state. Before Mbadinuju's rule, secondary education had been free of charge. But his administration imposed a tuition fee of 3,000 Naira per term for all secondary schools, which led to an unprecedented massive demonstration by secondary school students from all over the state. Many people attribute Mbadinuju's failure to political godfathers; his successor also struggled. On May 26, 2003, Chris Ngige was sworn in as the new governor of the state, but he was removed in March 2006 after Peter Obi of APGA filed charges against him of electoral malpractice. The Court of Appeal in Enugu asserted that Ngige's apparent victory in the 2003 election was fraudulent and ordered him to leave the seat. Obi was ousted by a faction of the Anambra State House of Assembly on November 2, 2006 and replaced by Virginia Etiaba, his deputy. On February 9, 2007, Mrs. Etiaba handed power back to Obi after the Court of Appeal had nullified Obi's removal. On April 14, 2007, Andy Uba of PDP was "elected" as the new governor of the state and, on May 29, was sworn in. Reported to be massively rigged, the election was widely criticised. On June 14, 2007 the Supreme Court of Nigeria ruled that Peter Obi's tenure had not ended; therefore there was no vacancy in the governorship. It removed Andy Uba from office and replaced him with his predecessor Obi. On 6 February 2010, Peter Obi was re-elected governor for a second term of four years, after a hot contest with Chris Ngige, a former governor of the state; Prof. Charles Soludo, a former governor of the Central Bank of Nigeria; and Andy Uba, who was a strong voice in the state's politics. Other contenders included Mrs Uche Ekwunife, Prince Nicholas Ukachukwu, and many others. Twenty-five contestants ran for the office. Obi was affirmed as the winner of the election, having more than 30% votes above the immediate runner-up. Chief Willie Obiano was sworn in on March 17, 2014 after winning the November 16, 2013 election. Governor Willie Obiano of All Progressives Grand Alliance (APGA) was sworn in for a second term in office on the 17th March, 2018 after the victory at 18 November 2017 elections. With an annual population growth rate of 2.21 percent per annum, Anambra State has over 60% of its people living in urban areas. It is one of the most urbanized states in Nigeria. The major urban centres of Anambra state are Onitsha, including Okpoko; Nnewi, and Awka, the state capital. Awka and Onitsha developed as pre-colonial urban centres: Awka was the craft industrial centre of the Nri hegemony. Onitsha is a city state on the Niger, having developed as a river port and commercial centre. Onitsha is a fast-growing commercial city, and has developed to become a huge conurbation extending to Idemili, Oyi and Anambra East LGAs, with one of the largest markets in West Africa. Nnewi (sometimes called the Taiwan of Nigeria) is a rapidly developing industrial and commercial centre. Designated as the state capital, Awka has regained its precolonial administrative eminence. Other main towns of Anambra state are: Abagana, Abba, Abacha, Umueri, Abatete, Achalla, Achina, Adazi Ani, Adazi-Enu, Adazi-Nnukwu, Agukwu, Aguleri, Agulu, Aguluezechukwu, Aguluzigbo, Ajalli, Akpo, Akpu, Akwaeze, Akwaukwu, Alor, Amaetiti, Amansea, Amanuke, Amaokpala, Amawbia, Amesi, Amichi, Amorka, Anaku, Atani, Awa, Otuocha Umueri, Awba-Ofemili, Awgbu, Awka-Etiti, Awkuzu, Azia, Azigbo, Ebenator, Ebenebe, Ekwulobia, Ekwulumili, Enugwu-Agidi, Enugwu Aguleri, Enugwu Ukwu, Ezinifite, Ezinihite, Eziowelle, Ezira, Ichi, Ichida, Ideani, Ifitedunu, Ifite-Ogwari, Igbakwu, Igbariam, Igbedor, Igbo-Ukwu, Ihembosi, Ihiala, Ikenga, Inoma, Iseke, Isuaniocha, Isulo, Isuofia, Lilu, Mbosi, Mgbakwu, Mmiata Anam, Nando, Nanka, Nawfia, Nawfija, Nawgu, Ndikelionwu, Ndi-okpaleke, Ndiukwuenu, Nibo, Nimo, Nise, Nkpologwu, Nkpor, Nkwelle-Ezunaka, Nneni, Nnobi, Nnokwa, Nnokwa, Nsugbe, Nteje, Nzam, Oba, Obeledu, Obosi, Ogbunike, Ogbunka, Ogidi, Ojoto, Okija, Oko, Okpeze, Omasi, Omogho, Omor, Ora-Eri, Oraifite, Oraukwu, Orsumoghu, Osumenyi, Owellezukala, Owelle-Olumbanasa, Ozubulu, Ubuluisiuzor, Ufuma, Uga, Ugbenne, Ugbenu, Uke, Ukpo, Ukpor, Ukwalla-Olumbanasa, Ukwulu, Uli, Umuanaga, Umuawulu, Umuchu, Umudioka, Umueje, Umuerum, Umueze Anam, Umuoba Anam, Umumbo, Umunnachi, Umunya, Umunze, Umuoji, Umuomaku,Umuona Unubi, Utuh et al. Anambra's history stretches to the 9th century AD, as revealed by archaeological excavations at Igbo-Ukwu and Ezira. It has great works of art in iron, bronze, copper, and pottery works belonging to the ancient Kingdom of Nri. These have revealed a sophisticated divine Kingship administrative system, which held sway in the area of Anambra from c. 948 AD to 1911. In some towns, such as Ogidi and others, local families had hereditary rights to kingship for centuries. Great Britain recognised some of these traditional kings and leaders in their system of indirect rule of the Protectorate of South Nigeria. Beginning in the 19th century, they appointed some noble leaders as Warrant Chiefs, authorizing them to collect taxes, among other duties. Anambra is in the Igbo-dominated area that seceded as part of an independent Biafra in 1967, following rising tensions with Northern Nigeria. During the Nigerian/Biafran war (1967-1970), Biafran engineers constructed a relief airstrip in the town of Uli/Amorka (code named "Annabelle"). Extremely dangerous relief flights took off from Sao Tome and other sites loaded with tons of food and medicine for the distressed Biafran population. Uli/Amorka airstrip was the site where American pilots such as Alex Nicoll, and scores of others, delivered tons of relief supplies to the Biafran population. Disgusted by the suffering and mounting death toll in Biafra from starvation, as well as the continuous harassment of the relief planes by the Nigerian Airforce, Carl Gustaf von Rosen resigned as a Red Cross relief pilot. He helped Biafra to form an airforce of five Minicoin planes Malmö MFI-9 stationed at the Uga airstrip. He named his tiny but effective airforce "Babies of Biafra" in honour of the babies who died from starvation inside Biafra. Old Anambra State was created in 1976 from part of East Central State, and its capital was Enugu. In 1991 a re-organisation divided Anambra into two states, Anambra and Enugu. The capital of Anambra is Awka. Nnamdi Azikiwe Owelle of Onitsha – the first President of the Federal Republic of Nigeria and historically, the only man whose name appeared in the Constitution of his country (Nigeria's Republican Constitution of 1963). Dr. Alex Ifeanyichukwu Ekwueme, hails from Okoh town, is a frontline Politician, Architect and the first executive Vice-President of Nigeria, serving 1979 – 1983. Nwafor Orizu – hails from Nnewi, the first Senate President of the Federal Republic of Nigeria. Dr. senator Chuba Wilberforce Okadigbo (December 17, 1941 – September 25, 2003) – a native of Ogbunike, was President of the Senate of Nigeria. 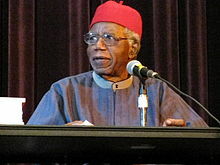 Professor Chinua Achebe – a native of Ogidi and best known for the classic, Things Fall Apart was the first African writer whose books are standard curricula in schools and universities across the world. Blessed Cyprian Michael Iwene Tansi (born in Aguleri, Anambra State, in September 1903 – died in Leicester, England, January 24, 1964) was an Igbo from Aguleri in Anambra East. He was ordained a Roman Catholic priest of the Archdiocese of Onitsha, Nigeria on December 19, 1937. He worked in the parishes of Nnewi, Dunukofia, Akpu/Ajalli and Aguleri and was later a Cistercian monk at Mount Saint Bernard Monastery in England. Pope John Paul II beatified him on March 22, 1998, saying "Blessed Cyprian Michael Tansi is a prime example of the fruits of holiness which have grown and matured in the Church in Nigeria since the Gospel was first preached in this land." Emeka Anyaoku – the first black Secretary-General of the Commonwealth and recipient of South Africa's Order of the Companions of Oliver Reginald Tambo for his role in initiating talks between the apartheid state and the African National Congress (ANC). Professor Uche Okeke – a native of Nimo and one of the foremost Nigerian fine artists, founder of the Uli movement. Lieutenant-General Chikadibia Isaac Obiakor, appointed in 2008 by UN Secretary-General Ban Ki-Moon as Military Advisor on UN Peacekeeping Operations. Previously served as Commander of the Economic Community of West African States Monitoring Group (ECOMOG) Artillery Brigade in Liberia in 1996 and 1997, and as ECOMOG Chief Coordinator of the Liberian elections in July 1997. Professor Humphrey Nwobu Nwosu. A Professor of Political Science. Former NEC Chairman. Conducted the freest, fairest and most credible election so far in Nigeria. Chinyelu Onwurah, a British Labour Party politician, who was elected at the 2010 general election as the Member of Parliament for Newcastle-upon-Tyne Central, becoming the first female British MP of African origin. Chuka Umunna, a British Labour Party Member of Parliament for Streatham constituency. Professor Kenneth Dike – a pre-eminent scholar of African History and native of Awka, was the first indigenous Vice-Chancellor of the University of Ibadan and founder of the National Archives. Professor Ben Enwonwu – a native of Onitsha was the first Nigerian sculptor of international repute with artwork gracing the United Nations headquarters. Pius Okigbo, CON – a world-renowned economist, was the first economic advisor to the Federal government of Nigeria (1960–1962), first Nigerian Ambassador to the European Community and renowned for bringing to light over $12 billion missing in oil windfall receipts from the Central Bank of Nigeria during the first Gulf War. Professor Samuel Okoye – was black Africa's first PhD in Radio Astronomy who along with Antony Hewish of the University of Cambridge discovered the radio source of Crab Nebula neutron star. Chief Jerome Udoji – from Ozubulu, a social reformer was the first African to be made a 'D.O' (District Officer) by the Colonial Administration. Amobi Okoye – Youngest American football player to play for the NFL (2004), currently is a free agent. P.N. Okeke-Ojiudu – a politician and Businessman and the first minister of agriculture in the Nigerian first republic. Oscar N. Onyema - OON, Chief Executive Officer of the Nigerian Stock Exchange and Chairman of Central Securities Clearing System (CSCS). Azikiwe Peter Onwualu, the former Director General and Chief Executive Officer of the Raw Materials Research and Development Council (RMRDC). 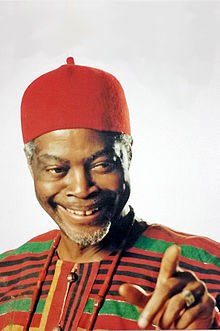 Chief Oliver de Coque, was a popular Nigerian highlife musician and guitarist. Chinwe Chukwuogo-Roy MBE, a London-based visual artist. The first black artist to paint a portrait of Queen Elizabeth II when commissioned to paint the official Golden Jubilee portrait. She was chosen as one of the UK Women of the Year in 2002 and 2003, represented the UK at the Council of Europe and was awarded an Honorary Doctorate of Letters by the University of East Anglia. During 2006 her work was represented on the national postage stamps of six countries. 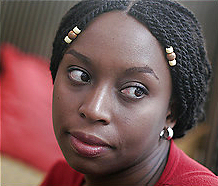 In 2008 she addressed the Cambridge Union Chukwuogo-Roy is a regular contributor to the BBC and other current affairs programmes. In 2009 she was made an MBE in the Queen's Birthday Honours List. ^ a b "C-GIDD (Canback Global Income Distribution Database)". Canback Dangel. Archived from the original on March 11, 2012. Retrieved 2008-08-20. ^ "Anambra State". Igbofocus.co.uk. Retrieved 2013-08-25. ^ vanguardngr.com, Nigeria (March 24, 2012). "Excitement as Orient Petroleum strikes oil in Anambra". vanguardngr.com. Retrieved December 3, 2015. ^ Thisday Live, Nigeria (August 3, 2015). "Anambra Refinery Targets 3,000 Barrels of Oil Per Day". thisdaylive.com. Archived from the original on September 26, 2015. Retrieved December 3, 2015. ^ "Affordable Building Concepts International to build houses in Nigeria". The Irish Times. October 30, 2015. Retrieved December 4, 2015. ^ ". Nigeria | Activities | Structure Plans for Three Urban Areas in Anambra State". Un-Habitat. 2013-08-13. Retrieved 2013-08-25. ^ "ANAMBRA TODAY: Obiano builds 3-Arms Zone, begins moves to relocate Govt House". The Sun, Nigeria. June 26, 2014. Archived from the original on December 8, 2015. Retrieved December 3, 2015. ^ UNESCO World Heritage Centre (2013-06-27). "Ogbunike Caves - UNESCO World Heritage Centre". Whc.unesco.org. Retrieved 2013-08-25. ^ Jochen Duckeck <http://www.JochenDuckeck.de/>. "Show Caves of Nigeria: Ogba Ogbunike". Showcaves.com. Archived from the original on 2014-02-01. Retrieved 2013-08-25. ^ "Nigeria - Encyclopædia Britannica". Britannica.com. 1960-10-01. Retrieved 2013-08-25. ^ "Ijele masquerade | Intangible heritage - UNESCO Multimedia Archives". Unesco.org. 2013-06-11. Retrieved 2013-08-25. ^ "Ngige out, Obi in as Anambra gov". Guardiannewsngr.com. The Guardian (Lagos). 16 March 2006. Archived from the original on October 24, 2007. Retrieved 2007-02-10. ^ "Anambra: How Etiaba Became Governor". Thisdayonline.com. Thisday (Lagos), November 4, 2006. Archived from the original on September 30, 2007. Retrieved February 10, 2007. ^ "Obi Floors Lawmakers - Take Over From Etiaba". tribune.com.ng. Nigerian Tribune (Lagos), Saturday, February 10, 2007. Archived from the original on February 11, 2007. Retrieved February 10, 2007. ^ "Reuters.com | Africa". Reuters. 2009-02-09. Archived from the original on 2007-12-21. Retrieved 2013-08-25. ^ "Secretary-General Appoints Lieutenant General Chikadibia Isaac Obiakor Of Nigeria As Military Adviser For Peacekeeping Operations". Un.org. Retrieved 2013-08-25. ^ "Nigerian National Merit Award" (PDF). www.nnma.gov.ng. ^ "ICTP Prize Winner 1985 — ICTP Portal". Prizes.ictp.it. Retrieved 2013-08-25. ^ "Chike Obi and Fermat's Last Theorem". Math.buffalo.edu. 1921-04-07. Retrieved 2013-08-25. ^ Queen's Jubilee portrait unveiled, BBC News, 12 March 2002. ^ Online, Saatchi (2013-08-19). "Sell Artwork, Buy Original Paintings, Art Prints, Discover New Artists | Saatchi Online". Saatchi-gallery.co.uk. Retrieved 2013-08-25. ^ "The Cambridge Union Society | Promoting free speech and the art of debating since 1815". Cambridge-union.org. 2011-06-16. Archived from the original on 2013-12-12. Retrieved 2013-08-25. Wikimedia Commons has media related to Anambra State.